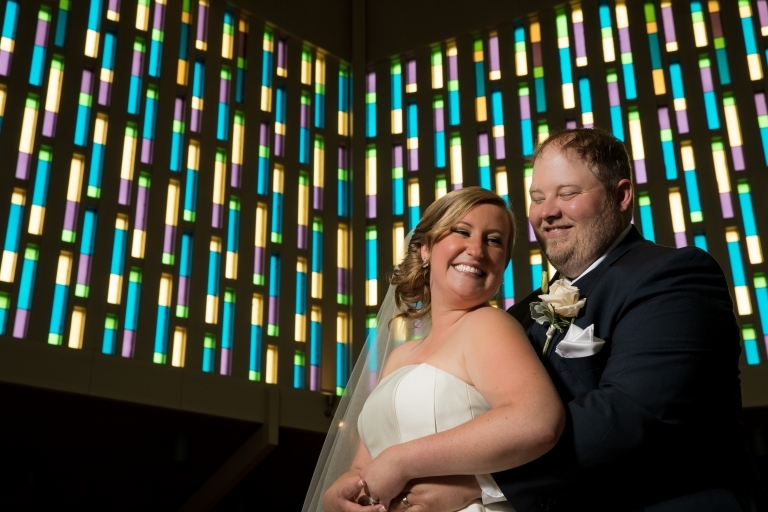 We are elated to share some of our favorite photographs from Andrea and Brad’s Wedding Ceremony at St. Martin of Tours and their Wedding Reception at the Crawford Auto Museum at the Cleveland History Center (Western Reserve Historical Society) in Cleveland, Ohio. As I had mentioned in my previous blog post, we’ve know Andrea and her family FOR-EV-A and we just adore each and every one of them. We already knew that this day was going to be special, but after getting to know Brad better during their engagement session, there was no doubt in our minds that their day was going to be SPECTACULAR! We have to believe that the theme of this wedding must have been cars… cars… CARS! As we had come to find out, Brad is really into rebuilding cars. Heck, last we checked, their driveway has at least three vehicles he is currently rebuilding. Andrea’s father Jim is also into restoring cars; however, his passion project is about one very special car in particular. For this joyous and special occasion, Jim brought his prized 1930 Ford Model A to the church for an unique bridal photo opp. So cool!!! Following a brief stop at Andrea’s parents’ house for some lunch, we headed out to the Cultural Gardens for bridal party photos. After our session at Hungarian Gardens concluded, we decided to make our way to the Western Reserve Historical Society, but not before a ridiculously failed attempt to park the trolley by the Irish or Polish Gardens (I’d like to give credit to Chris for that – lol). It was there at the WRHS where our creative juices REALLY started flowing! We were able to craft so many dynamic images thanks in part to the unique spots we found throughout the museum and also to having such a phenomenal and easy going couple to work with. Andrea and Brad, you had such a wonderful wedding and we would just like to thank you again for trusting us to capture your precious memories. I’ve got to say that there are so many amazing photos from throughout your day that it made it almost impossible to pick which ones to blog. We hope that you LOVE these favorites from your wedding day as much as we do!